On a typical afternoon, West Hall is quiet. The lobby walls, though, speak loudly of the energy beneath this silence. Flyers advertising social events, volunteer activities, and study groups cover the bulletin boards, and when the residents return from their classes, one of the liveliest communities on campus awakens. In fall term of 2012, West Hall became the Honors College’s (HC) official campus residence after over a decade of partnership with McNary Hall. In its first year, the hall community received half of the awards given at the annual Residence Hall Association Awards Banquet, far and away the most of any hall. West received top prizes for Star Resident, Innovative Program of the Year, Resident Assistant of the Year, Hall Council President of the Year, and Hall with It All, the latter given to the best overall hall council based on its programming, involvement with campus partners, and ability to serve residents. “We work to create a dynamic and positive living community where students feel they can learn and grow,” says LeeAnn Baker, director of student success and engagement for the HC. “We try and bring academic programming into the hall,” she added, which creates a community that actively supports the HC student experience. This is particularly important for the first-year students who make up the majority of the hall’s residents. For example, in fall term of 2013, the HC paired a first-year experience course with West. The students in the class who lived in the hall had planned dinner conversations with a resident assistant and their classmates. “West residents, because of the population, are of similar mindsets,” says Karen Ast, a graduate assistant with the college who lives in West and works with the hall’s resident assistant staff and hall council. “[The residents] are seeking out a residence hall with other academically minded students. 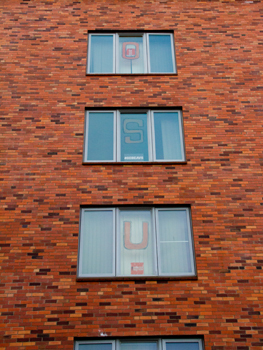 They are seeking an environment where other people will understand that they study quite often, and that won’t be looked down upon.” That academic focus is something the hall receives campus-wide recognition for, too: last year, West had a higher overall GPA than any other residence hall at Oregon State University. By bringing programming into residential and social locations, the HC is working to help students connect their academics with their community and the contemporary world. A New York Times readership program offered in partnership with OSU Academic Affairs, for instance, allows all HC students to access daily copies — either physical or digital — of the New York Times from West’s main lobby. Hall staff members are currently developing a discussion group as a part of the program. The significance and potential impact of residential programming was magnified this year with the introduction of an on-campus living requirement for all first-year students as a part of OSU’s First-Year Experience initiative. A “good majority” of HC freshman live in West now, according to Ast, and the hall is increasingly a central point for the entire Honors community. “It’s a nice space for events,” Ast says, “even when they’re for the entire college. A lot of the programs [in West] are Honors-specific, so that’s very different than other halls.” Only HC students can apply to live in West, and ninety percent of residents are in the college; per university policy, University Housing and Dining reserved the remaining rooms for athletes, students with disabilities, and international students. West is one of the smaller residences on campus, and its unique features make it desirable to many HC students. 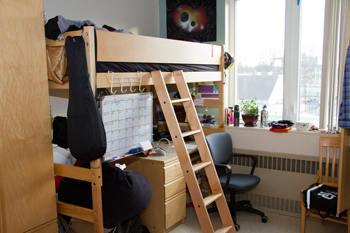 In addition to the typical amenities all OSU residence halls have, like in-hall tutors and on-site laundry facilities, West has suite-style rooms, a large kitchen, computers on each floor, study and meeting spaces, and on-site HC advising. Ast opens her office door to students as well, giving them “another person to go to” with concerns or questions, she says. Note: The Honors College apologizes for the previous title of this article, “Westward Expansion.” A reference to the history of American colonization was unintentional, and we deeply regret any offense that this caused. If you have any concerns, please email us at honors.college@oregonstate.edu.